Call Susan Moore at (678) 318-2050 for Legacy Lodge room reservations. The New Year is approaching, and it is time to start planning for 2019. Let me invite you to a Pastors Wives Gathering on February 28 – March 2, a Thursday Evening through a Saturday Morning. This event differs from the East/West Coast Calvary Chapel PW conferences. It is not designed to replace them, but add an opportunity for encouragement closer to home, as well as provide a different style. This is more a “gathering” of women than a conference. With a smaller group, we can have more personal interaction. Each study in God’s Word is followed by “table talk” to discuss the topic, and facilitate fellowship among us. I believe women long for this kind of meaningful connection. I have titled the Gathering, “Colors To Live By – Choosing A Life Of Integrity.” We will be exploring the life of Joseph, a man who not only wore a coat of many colors, but who’s life was colored by many disappointments, betrayals, and regrets. Yet despite his troubles Joseph maintained a purity and godly devotion. He was used mightily by God. There is much we can learn from his example. Due to the nature and sensitivity of the discussion times, we are limiting attendance to just women who are the wife of a pastor (however your church recognizes a pastor). Our Gathering is not exclusive to the Calvary Chapels in the “Deep South” region. Feel free to pass this letter on to other pastors wives you would like to invite. The three-day Gathering will be held at Legacy Lodge, a beautiful resort on Lake Lanier Island, about one hour north of Atlanta. If you fly into Atlanta, let us know so we can help you with transportation to and from the airport. The resort offers a wonderful atmosphere and a bit of pampering that will allow you to focus on your spiritual journey. Important! YOU are responsible for reserving your own lodging accommodations at Legacy Lodge. This allows you to select roommates of your own choosing and divide up the cost. Discounted room fees have been negotiated. Please call the hotel direct for any room reservations made as of January 28, 2019. Our contact is Susan Moore. Her phone number is (678) 318-2050. If you have any problems with obtaining a room, please contact us for assistance. In addition to your room reservation, you must register for the conference with Calvary CSM. This registration fee is separate from the lodging, but covers all our meals at Legacy Lodge, as well as other conference costs. To register online for the conference, scroll to one of the REGISTER ONLINE sections at the top and bottom of this page. Select your number of tickets and click the “Register Now” button. Follow the steps presented to you. If you have questions, please contact me personally at [email protected] or (404) 451-4513. I am so excited about our time together, and truly feel God has something special for us all. I pray you will make this event a priority for 2019. Includes all conference materials, plus food all day Thursday through Saturday morning. 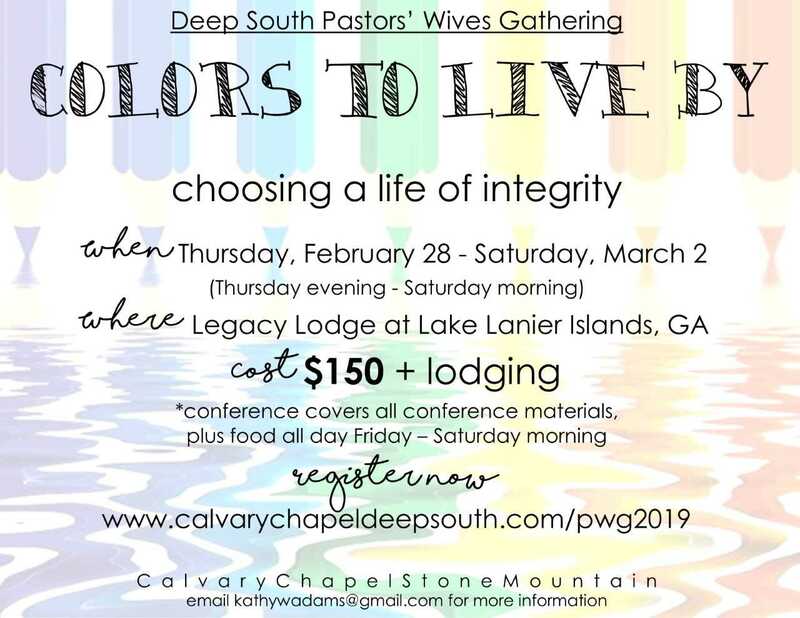 Deep South Pastors’ Wives Gathering is hosted by Calvary Chapel Stone Mountain, GA. The cost for a two (2) night stay is $355.17 ($139/night, tax & resort fees). If you find a better rate than $139/night, Legacy Lodge will price match. All reservations booked will require a one night deposit based on the contracted group rate OR if rooms are no longer available in our block then it will be based on their “Best Available Rate”. Our block of rooms has been filled as of January 28, 2019. Susan Moore and the Reservations Team may continue to sell rooms to you at their “Best Available Rates” based on availability. To secure a room reservation, call Susan Moore at 770-945-8787 or 678-318-2050.